Courtlyn Oswald of the Bison women's hockey team. 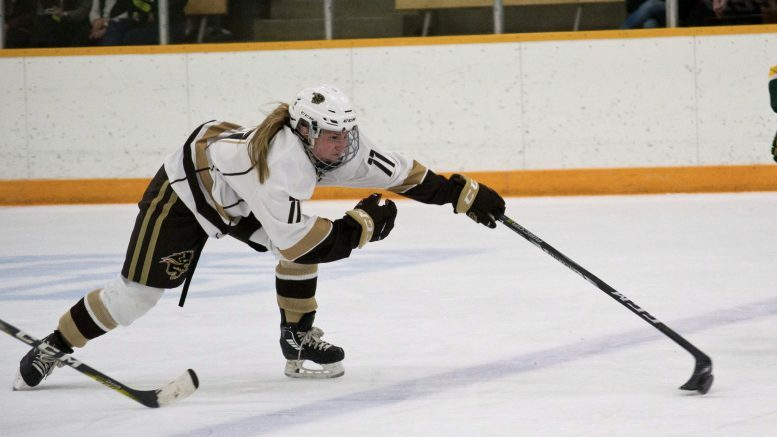 This weekend the University of Manitoba women’s hockey team stayed hot, moving their winning streak to nine with a sweep against the University of Calgary. On Friday, the Dinos scored first, with Morgan Loroff beating Bisons goaltender Rachel Dyck at 13:32 of the first period. but the lead wouldn’t last long. In the second, the Bisons came storming back. Natasha Kostenko picked up her first goal of the season, and then two minutes later Sheridan Oswald potted her second of the year. Then after Carley Wlad tied the game for the Dinos midway through the frame, penalty trouble sank the home side. Poor discipline put the Dinos down five-on-three, and the Bisons scored two times on two attempts with the advantage. Jordyn Zacharias continued her scoring barrage, picking up her eighth of the season and setting up Alanna Sharman 40 seconds later. Dyck made 15 saves as the Bisons cruised to the 4-2 win. Kelsey Roberts of the Dinos faced 35 shots in the loss, ending a two game shutout streak. Calgary got on the board first again in game two on Saturday. Delany Frey did it all herself, notching her second of the season in the early going. However, Zacharias once again had an answer for the herd. She picked up her league-leading ninth of the season, taking advantage of a Dinos turnover and putting one by Roberts. Courtlyn Oswald added another goal in the second to put the Bisons up 2-1 and in the third Venla Hovi put the game out of reach for the Dinos. Hovi snagged a turnover, moved in and put a shot through Roberts’s five-hole to pick up her third in her return to the Bisons lineup. Lauren Taraschuk made 14 saves in her return to the Bisons crease, picking up her Canada West leading sixth win. The Bisons have now won nine in a row and sit five points clear of the Alberta Pandas, holding down first-place. 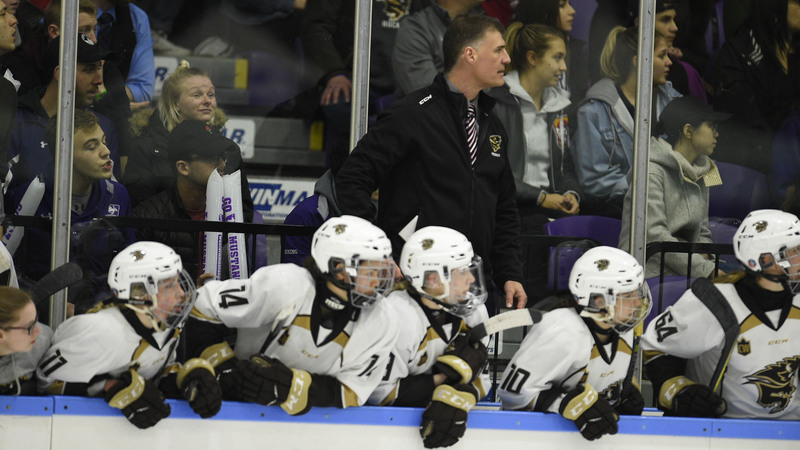 Manitoba finishes the first half of the regular season at home against the UBC Thunderbirds on Dec. 1-2 at the Wayne Fleming Arena.